The Partech Shaker is host to the Techstars Paris accelerator program since September 2017. We begin today a series of interview of the startups that are part of the first class of Techstars Paris. Let's start with Leon Kotovich, CEO of Terra Manta, an American startup! 1. Please tell us about your business. How might you describe Terra Manta to someone who has never heard of it before? 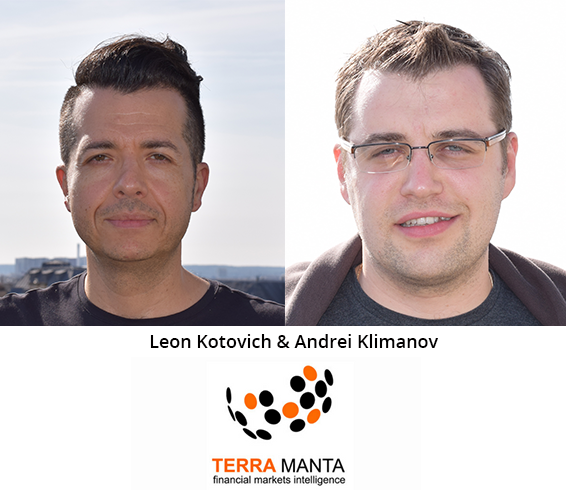 TerraManta helps investors reduce economic risks by providing deeper insights from analysis of growing volume of unstructured data using Natural Language Processing and machine learning technology. Our first product: TerraManta for Crude Oil. By combining analysis of fundamental factors and geo political drivers, TerraManta provides customers with more accurate information about longer term volatility of crude oil prices. 2. What kind of difficulties have you encountered as a founder and how did you cope with these challenges? The main difficulty was educating potential customers and investors about TerraManta when the company was in the earliest stage. This is the story we tell now. Imagine stress, stress in its purest form, when crude oil prices decrease from $110 to $29 per barrel. By the way, that’s exactly what happened in 2015 and United Airlines lost $1B on closing fuel hedges. So – what do people who care about crude oil prices do when they come to the office? They read the news, looking for topics which may influence crude oil markets. How many news items can they read? 100 or 200? What about headlines - perhaps 200 or 300? But is it enough? Can they read 3,000 news items per day? Or - go back 6 months ago, 1 year go, or even 2 years ago and correlate all topics which influence crude oil markets? TerraManta can. Because there has to be a better way to UNDERSTAND news or unstructured data, together with traditional structured data, but with a very specific domain view, in this case what impacts crude oil prices. 3. How do you envision the Techstars program contributing to the development of your company? The value of mentor program, advice, guidance, introductions to investors and Techstars for Life cannot be even measured. 4. You come from the US, and you're participating in the Paris Techstars program. Have you noticed any differences between the French and the US start-up ecosystem? If yes, please describe them. I think there is actually very little difference in the startup ecosystem other than the number of startups and number of investors. Smart people anywhere in the world see the same problems and try to solve these problems. 5. What do you appreciate most about working in Paris? Did you gain weight from eating too many croissants and patisseries when you first arrived here? Paris is an incredible city with so much to offer after a long day at work. No, I did not gain any weight although temptations are on the every corner. To know more about Terra Manta, check their website!